Hi it's Bev here today ... for Saturday layout projects for One Crazy Stampers using High Hopes Stamps. 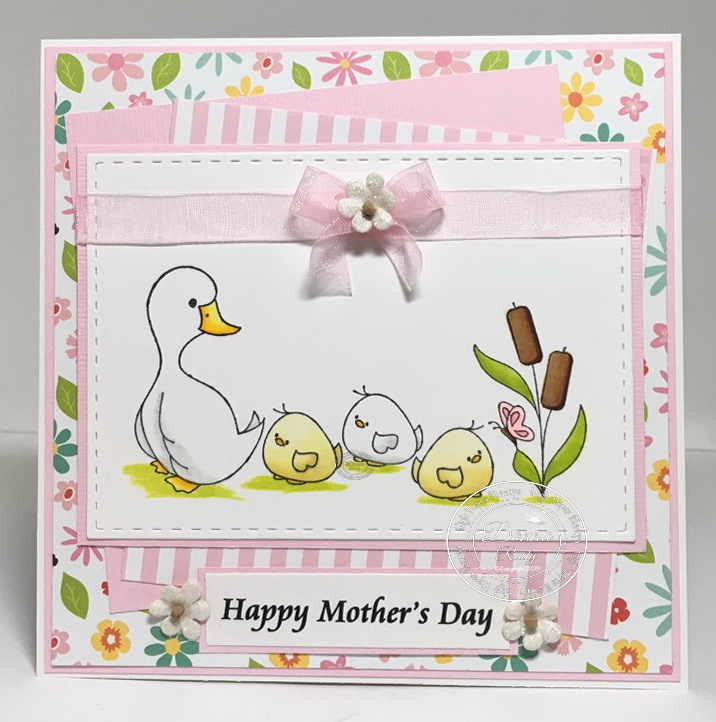 I also am thrilled to tell you that I will not be doing cards but scrapbook layout pages and some of the accents will be co-ordinating stamps for the themes of the projects. It should be great fun. 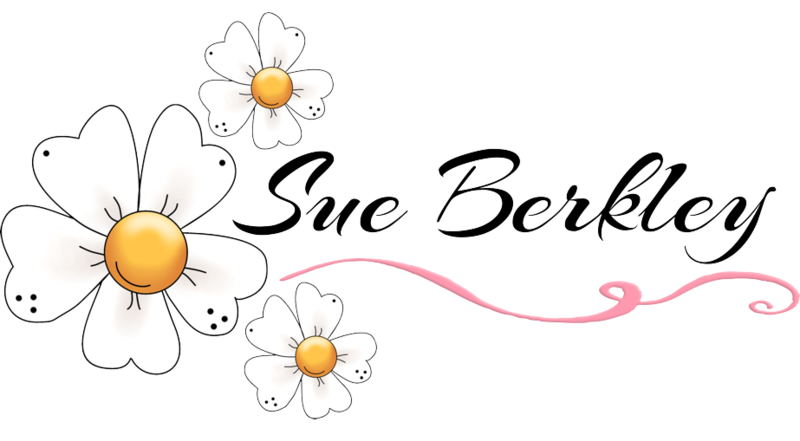 I will be sharing with you every Saturday so mark your calanders ... I would love to see you again. 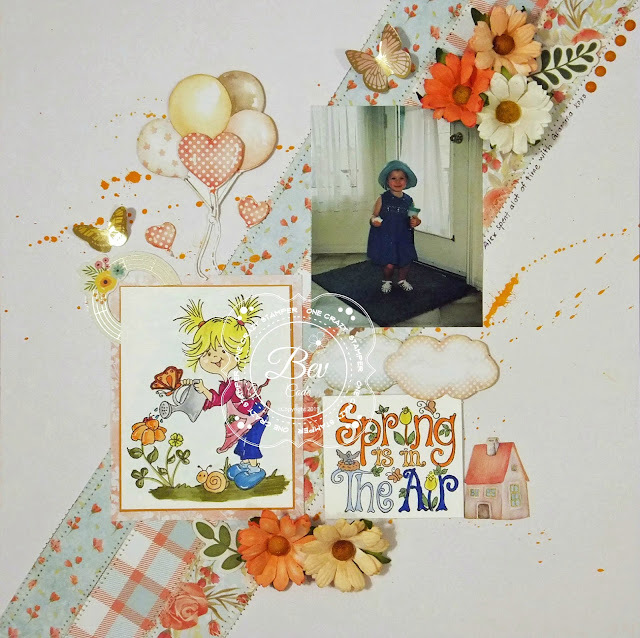 This page is my eldest Grand Daughter. She spent lots of time with me when she was little. I loved my time with her and she put a smile on my face for sure. She is so sweet. To start my project I stamped the images .... Fragrant Blooms and Springy Saying. 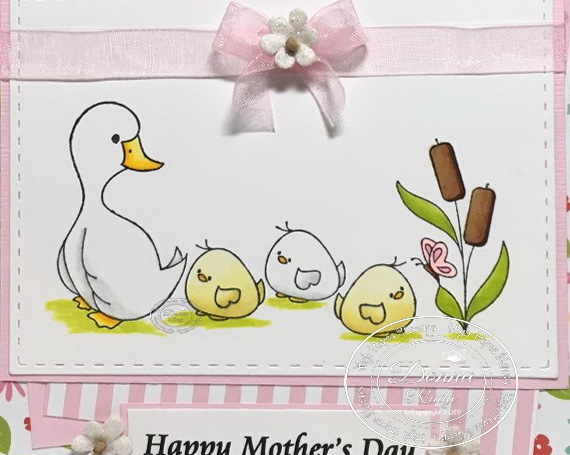 It was then coloured using copic markers and the highlights are signo white gel pen. 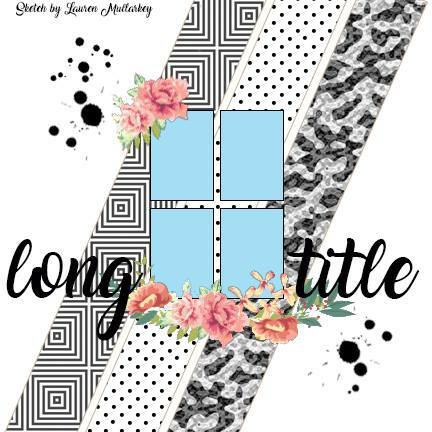 To create this page I used Stick it Down above to inspire my page. 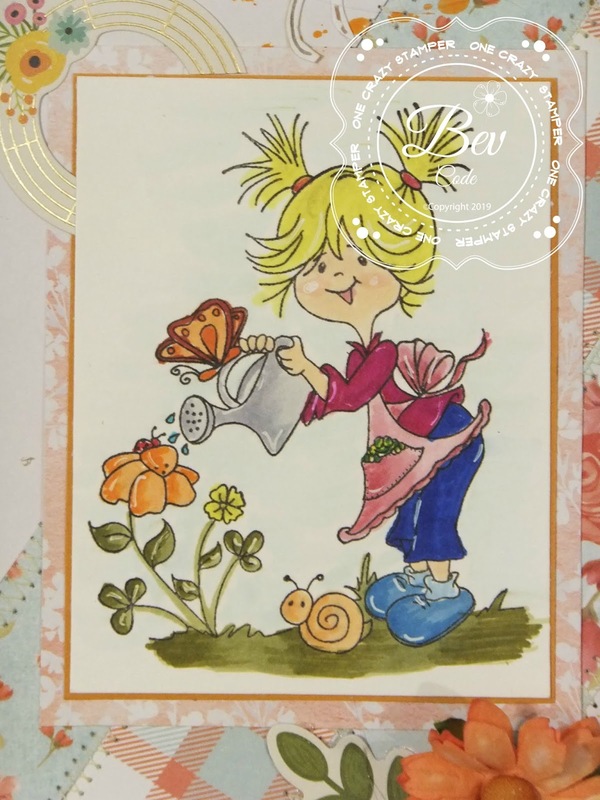 Stamp: Fragrant Blooms TT040, Springy Saying P133. After stamping the image with Tsukineko Memento Tuxedo Black Ink on XPress It Blending Cardstock, I coloured it with Copic Markers. 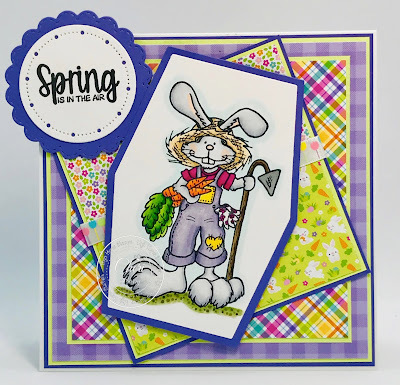 I used a double stitch oval die to cut the image out, and then used the Quilted Backdrop die from Lawn Fawn with the Buncha Scraps Floral Blends papere. Be sure to stop by the One Crazy Stamper blog and Facebook Pages for some daily inspiration from the Design Team Divas. You can also follow us on Instagram, Twitter and Pinterest. 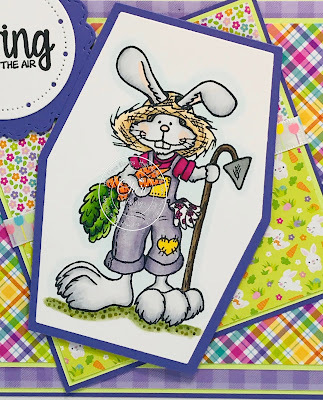 Did you know the One Crazy Stamper design team posts daily inspiration on the Facebook page and blog?! Inspiration can also be found on Instagram and Pinterest! Today is Wednesday and I'm back to share this little gopher who is feeling a little blue right now from the new Get Well Soon collection. 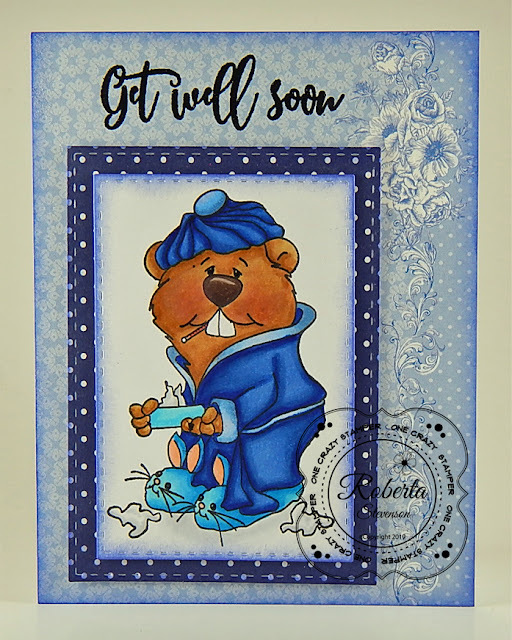 The stamp I'm featuring is called Take A Tissue (High Hopes Rubber Stamps) and the sentiment is Get Well Soon Script 2 (High Hopes Rubber Stamps)! 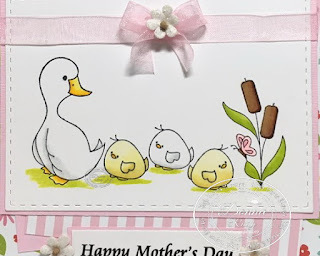 You can find lots of inspiration from the Design Team Divas at the One Crazy Stamper blog, and the One Crazy Stamper Facebook Fan page plus you can also follow us on Instagram, Twitter and Pinterest. Hi there and here we are at the start of a new week. 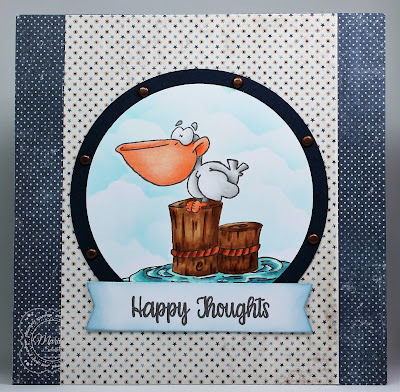 For today's card, I am using Pelican's Post which is an older image from High Hopes. I've had it for a long time but never had a chance to use it - I always say I like to let my stamps cure! 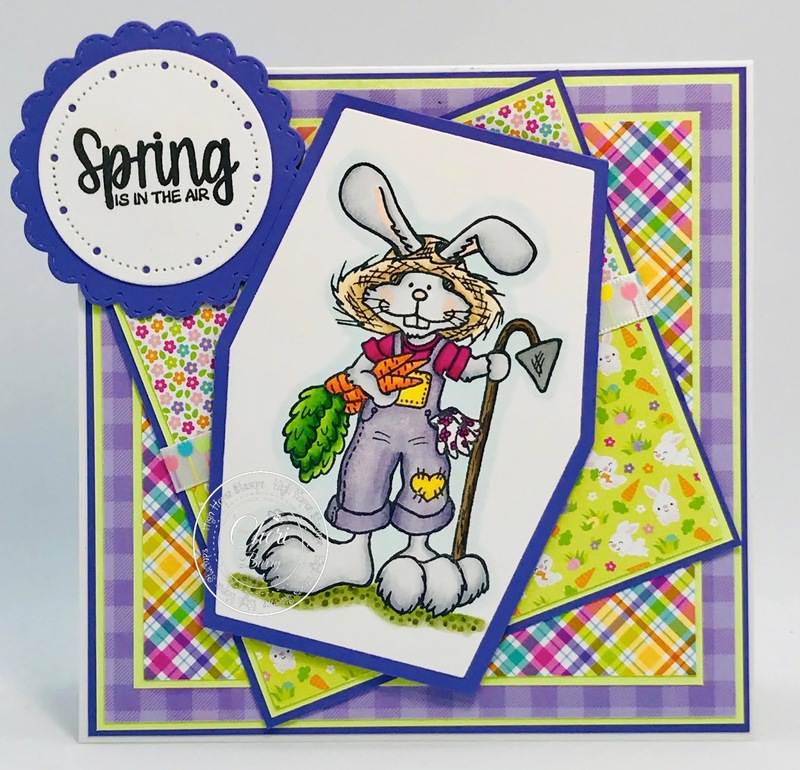 Anyway, we moved a couple years ago and ever since I was asked to join the One Crazy Stamper design team, I have been rooting around trying to find some of my stamps. Finally I had a bit of success and found three but there's a few more so I'll probably obsess about that until I find them. At any rate, I've always liked this stamp so am happy to finally use it. This page is my 2 youngest Grand Children outside in the snow at my house. 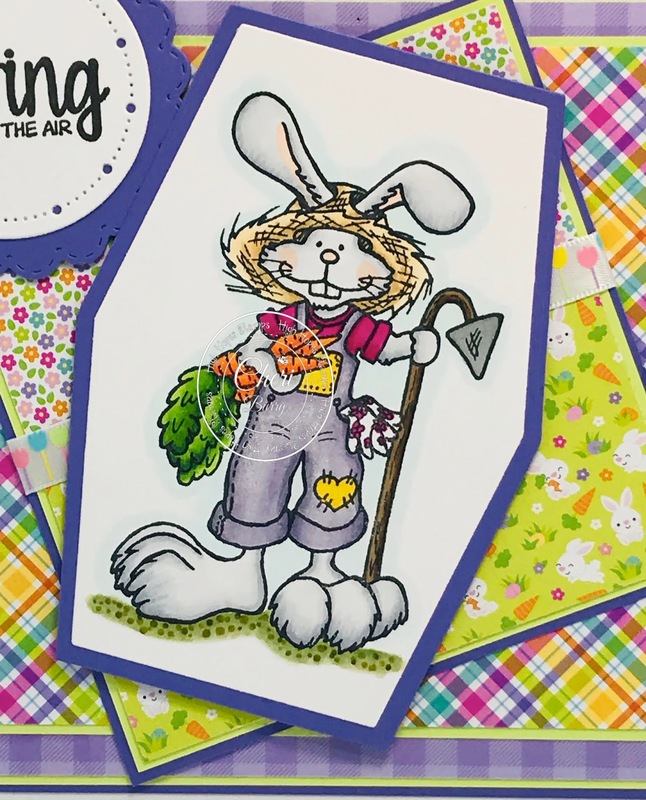 With the fab papers, accents and finished off with the Love of Labour stamped and copic coloured image accent. 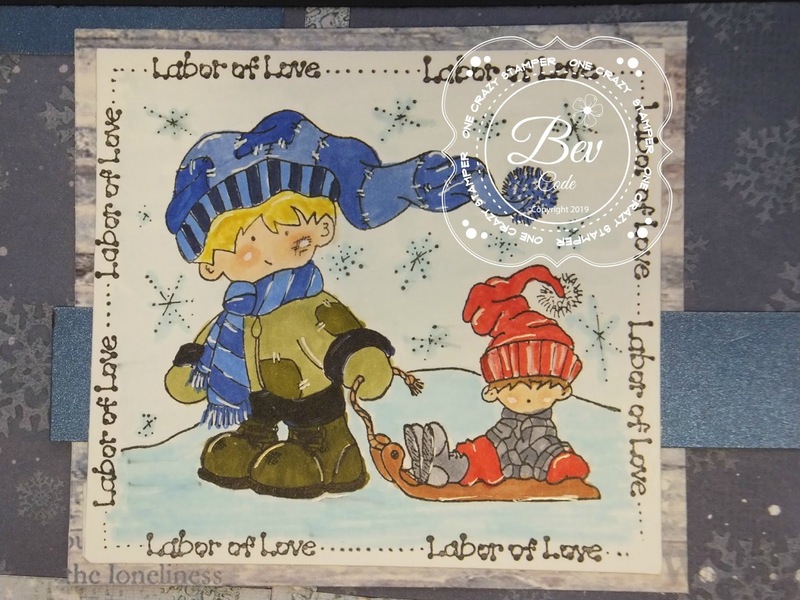 To start my project I stamped the image .... Labor of Love. Lots of times I choose colours that match the photos I plan on using. 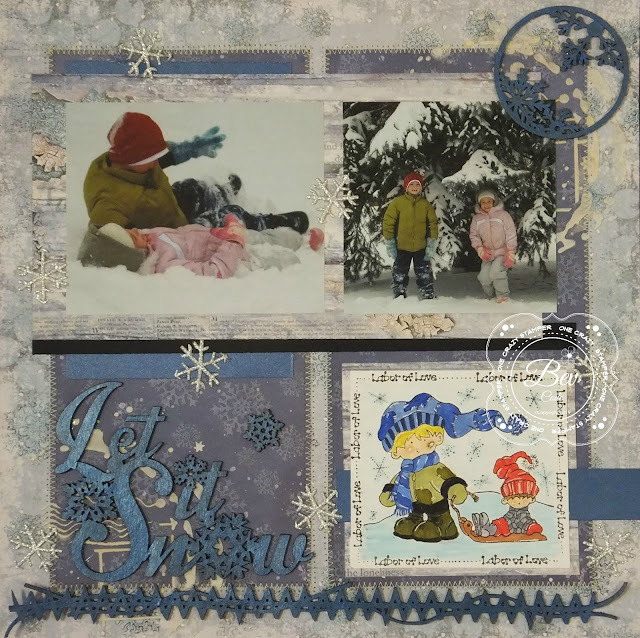 Other: The Rubber Buggy Stamperia Blue Stars Paper Collection, Creative Embellishments Chipboards, Stencil, Gesso, signo white gel pen, cardstock, snowflake lace, machine stitching. It seems that Mother Nature can't make up her mind lately; as the weather has been on a bit of a roller coaster this past week -- one day it seems like Spring is here, then Winter comes back. 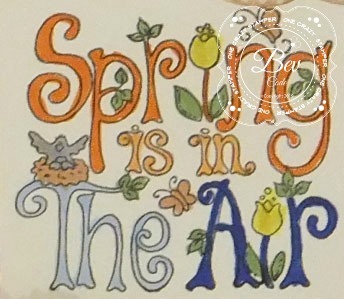 Did some say "Spring" has arrived. 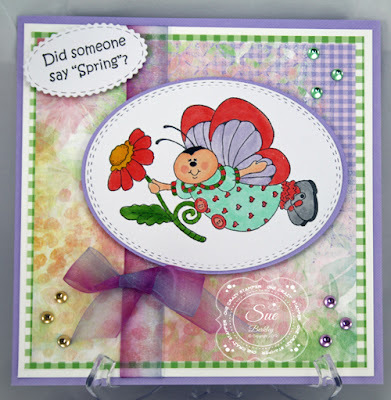 For my card today, I have used the adorable Bedelia Butterfly. 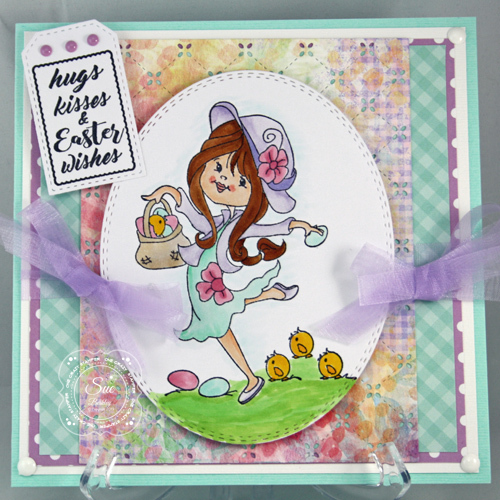 After stamping her on some XPress It Blending Cardstock, I coloured her with Copic Markers. 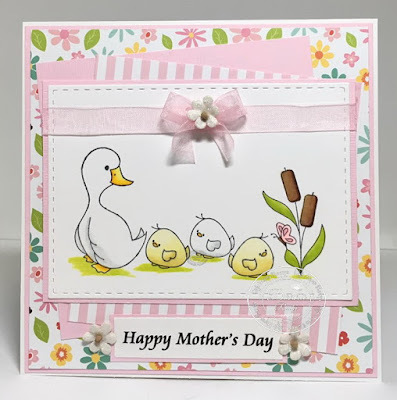 If you are attending Scrapfest this weekend in Kitchener, do come and visit us at the One Crazy Stamper and High Hopes Stamps Booth. Spring is here and my dog has Moe has his "spring beans" as I call them. It is like the whole winter he has saved his energy so when spring arrives he becomes my wild child. Everything is done with a spring in his step and his chest pushed out like he owns the world. The playful goats stamp reminds me of the pent up energy that my dog has - you know the kind......when all you want to do is run, play and kick up your heels! 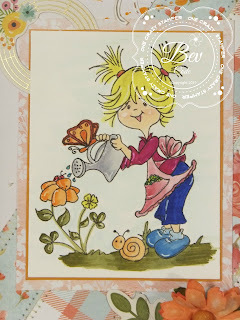 After colouring my stamp with alcohol markers and Prisma pencils I hand fussy cut it. 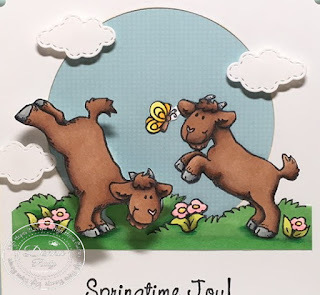 I wanted to put the goat on the left that is bucking on an action wobble so I cut him out completely. The mini action wobble is literally the width of his body so I had to be very precise with my placement but it sure adds a fun element! 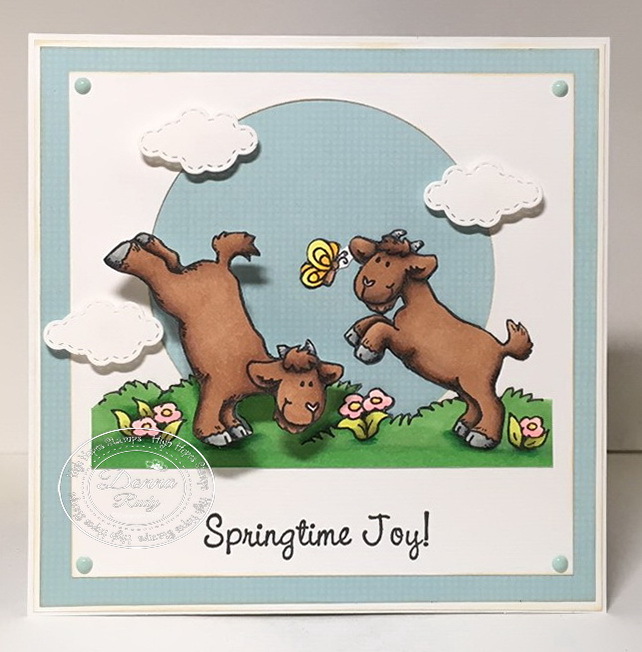 I wanted to keep my layout more to the CAS side of card making to keep the focus on this fun stamp, so I grabbed some blue check paper and some white card stock andcut a circle out of if. 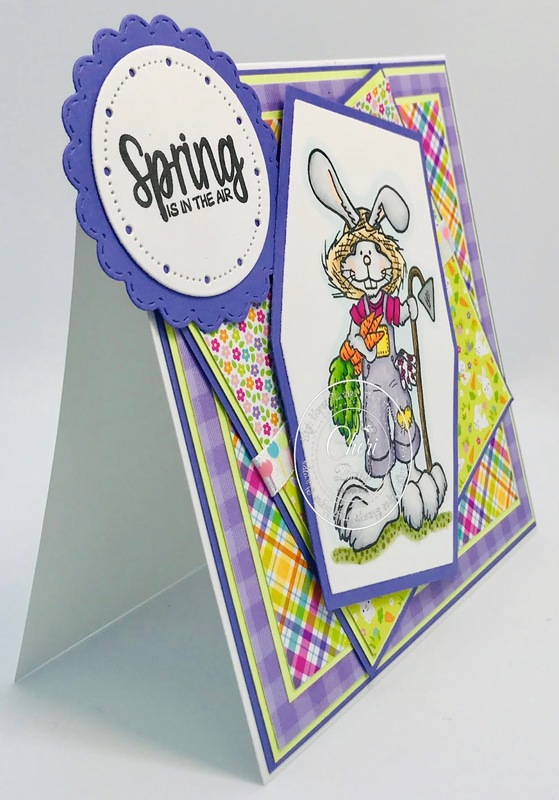 I the card stock in to my Misti and placed the sentiment and stamped it. All of the paper is edged with antique linen distress ink, stitched clouds popped up with foam dots and some enamel dots finish off my fairly CAS design.